There are so many different makes and types of bottles to choose from if you decide to bottle feed that it is difficult to know whether you are buying the right thing for your baby. 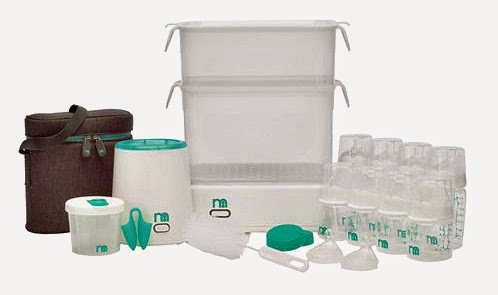 We purchased the Innosense Ultimate Starter Set from Mothercare which includes everything you'll need to get you started. Now that we've been using it for 5 months, I thought it would be time to write a review and, as with all the major purchases we've made, I'll only write about it if we rate it highly enough to honestly recommend it so you know it's good already! The electric steam steriliser is easy to use and the double stack allows you to be uber efficient - key when you know you have a feed looming and you need to get several bottles sterilised for a long day/night ahead. You simply add water in the base and pop the tubs (or one on its own) on the top with washed bottles inside. Hey presto, 7 minutes later, your bottles are sterilised and ready to go. The steriliser has its own version of the traffic light system (green - red - blue - green), so when the button glows green again, you know the bottles have cooled down enough to prepare. The bottle warmer has also been a God-send, ensuring that we avoid any of those dreaded hot spots when bringing the milk to temperature. It's quick and easy to use as well as being easily portable; we keep ours on the bedside table ready for night-feeds and have taken it with us when we go away. The design of the bottles is also excellent. Unlike conventional bottles, the teats are positioned off-centre in a wide neck so you don't need to tip them as high to ensure that they stay full. This helps avoid air bubbles, sucking on air, trapped wind and the awkward feeding position with many others. The starter set comes with 10 teats - 8 slow flow and 2 vari flow. As I've mentioned in previous posts, our little one had trouble feeding (we were readmitted to hospital at the start of the second week, having only been discharged a few days earlier) and found slow flow teats (we tried lots) difficult to use so we found ourselves using the vari flow teats. They really helped me build up Charlie's feeds as the combination of his heavy sleeping and poor sucking reflex made everything else hard work. The double bottle bag is exactly what you'd expect. It keeps bottles warm and, if I'm going out, I tend to leave making bottles until the last minute and pop them straight in to keep the temperature up for as long as possible. My only criticism of the set is the milk powder dispenser as the formula gets stuck in the narrow corners and results in waste and less accurate measuring. It is a minor factor though and it would probably be the same with any multi-compartment container. We are really glad we went with the Innosense Ultimate Starter Set and, definitely, recommend it. Using it has become second-nature to us both and the fact that you get everything you need in one purchase makes it even more appealing! We were lucky enough to get ours in the Mothercare sale at half price, £64.99, but they often have deals, so snap it up when you get a chance. my first visit to your blog and it's really nice. by the away here i have written an article about baby bottle warmer. Hi : The bottle warmer has also been a God-send, ensuring that we avoid any of those dreaded hot spots when bringing the milk to temperature. It's quick and easy to use as well as being easily portable.read more info of best baby bottle warmer.